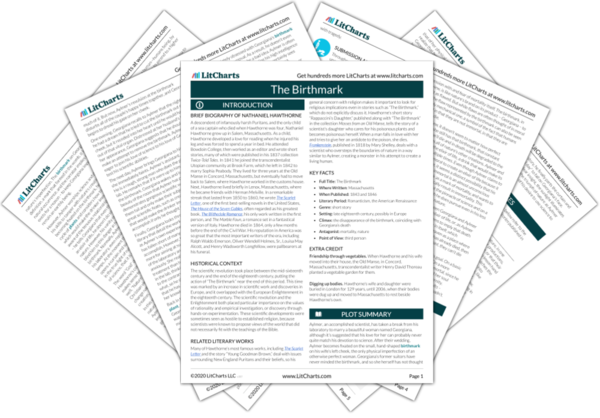 Instant downloads of all 942 LitChart PDFs (including The Birthmark). Welcome to the LitCharts study guide on Nathaniel Hawthorne's The Birthmark. Created by the original team behind SparkNotes, LitCharts are the world's best literature guides. A concise biography of Nathaniel Hawthorne plus historical and literary context for The Birthmark. A quick-reference summary: The Birthmark on a single page. In-depth summary and analysis of every of The Birthmark. Visual theme-tracking, too. Explanations, analysis, and visualizations of The Birthmark's themes. The Birthmark's important quotes, sortable by theme, character, or . Description, analysis, and timelines for The Birthmark's characters. Explanations of The Birthmark's symbols, and tracking of where they appear. An interactive data visualization of The Birthmark's plot and themes. A descendent of infamously harsh Puritans, and the only child of a sea captain who died when Hawthorne was four, Nathaniel Hawthorne grew up in Salem, Massachusetts. As a child, Hawthorne developed a love for reading when he injured his leg and was forced to spend a year in bed. He attended Bowdoin College, then worked as an editor and wrote short stories, many of which were published in his 1837 collection Twice-Told Tales. In 1841 he joined the transcendentalist Utopian community at Brook Farm, which he left in 1842 to marry Sophia Peabody. They lived for three years at the Old Manse in Concord, Massachusetts, but eventually had to move back to Salem, where Hawthorne worked in the customs house. Next, Hawthorne lived briefly in Lenox, Massachusetts, where he became friends with Herman Melville. In a remarkable streak that lasted from 1850 to 1860, he wrote The Scarlet Letter, one of the first best-selling novels in the United States, The House of the Seven Gables, often regarded as his greatest book, The Blithedale Romance, his only work written in the first person, and The Marble Faun, an influential collection of poetry. Hawthorne died in 1864, only a few months before the end of the Civil War. His reputation in America was so great that the most important writers of the era, including Ralph Waldo Emerson, Oliver Wendell Holmes, Sr., Louisa May Alcott, and Henry Wadsworth Longfellow, were pallbearers at his funeral. 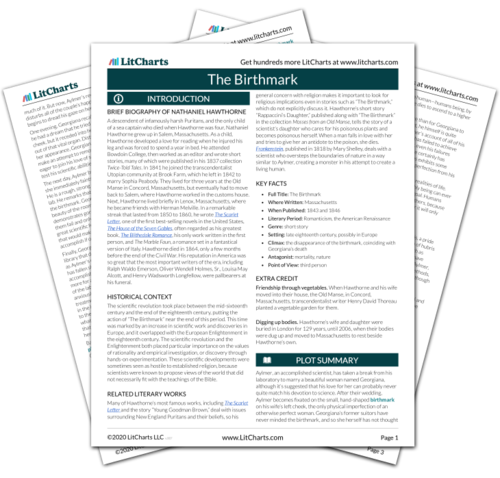 Get the entire The Birthmark LitChart as a printable PDF. The scientific revolution took place between the mid-sixteenth century and the end of the eighteenth century, putting the action of “The Birthmark” near the end of this period. This time was marked by an increase in scientific work and discoveries in Europe, and it overlapped with the European Enlightenment in the eighteenth century. The scientific revolution and the Enlightenment both placed particular importance on the values of rationality and empirical investigation, or discovery through hands-on experimentation. These scientific developments were sometimes seen as hostile to established religion, because scientists were known to propose views of the world that did not necessarily fit with the teachings of the Bible. Many of Hawthorne’s most famous works, including The Scarlet Letter and the story “Young Goodman Brown,” deal with issues surrounding New England Puritans and their beliefs, so his general concern with religion makes it important to look for religious implications even in stories such as “The Birthmark,” which do not explicitly discuss it. Hawthorne’s short story “Rappaccini’s Daughter,” published along with “The Birthmark” in the collection Mosses from an Old Manse, tells the story of a scientist’s daughter who cares for his poisonous plants and becomes poisonous herself. When a man falls in love with her and tries to give her an antidote to the poison, she dies. Frankenstein, published in 1818 by Mary Shelley, deals with a scientist who oversteps the boundaries of nature in a way similar to Aylmer, creating a monster in his attempt to create a living human. Friendship through vegetables. When Hawthorne and his wife moved into their house, the Old Manse, in Concord, Massachusetts, transcendentalist writer Henry David Thoreau planted a vegetable garden for them. Digging up bodies. Hawthorne’s wife and daughter were buried in London for 129 years, until 2006, when their bodies were dug up and moved to Massachusetts to rest beside Hawthorne’s own. Greider, Julia. "The Birthmark." LitCharts. LitCharts LLC, 14 Dec 2016. Web. 18 Apr 2019. Greider, Julia. "The Birthmark." LitCharts LLC, December 14, 2016. Retrieved April 18, 2019. https://www.litcharts.com/lit/the-birthmark.